Spanish is one of those languages that sounds extremely nice in my ears. I wish I could speak it, but at least I can say Dia de los Muertos all day today. It’s a Mexican Holiday that any artist must fall in love with because it is not only about remembering our dead but celebrating life; our craft, beauty and what is sweet in life. People there cook to feed the souls of the dead, and I think all the beauty this tradition creates is feeding our living souls too. It’s about bringing death and life together (at least it seams to be about that to me), just like the sugary rose in my previous photo post – summer vs. winter, death vs. life. Or death together with life, walking hand in hand? When I see these cards scanned and published here I’m thinking Wow, did I draw these? I don’t do much drawing but when I do I feel good about myself and my abilities… I don’t have an art education in any way and still, I like what I can do on paper! When I see what other people draw I always get impressed, but the funny thing is I can be impressed with myself too! It’s not great art, but it’s (by) me – on paper. It depicts what I had on my mind and I think that is amazing. I do love the collages I make but hey, other art forms are here too, ready to be explored in another phase of my life. I like that thought a lot, even though I usually wish I could do it all right now. I was away yesterday (dinner with friends) and didn’t blog, but even though this post is late it is my blog, my rules. All Saints’ Day (as it’s called here in Sweden) is celebrated in Mexico both November 1 and November 2 collectively, in commemoration of the dead. So I’m only late for my time zone, there is a comfort in that too. Not the best photo but oh how fun it is to have scissors that glitter and sparkle!!! Love it! Yeah, after all my complaints about Halloween we had four scary kiddos ringing the door bell (a Martian, a ghost and some zombies), I got a Halloween gift and then got invited to a dinner! I hope you’re having a great day – I am. The sun is shining and I’ve already been out walking. This entry was posted in Creative habits, Draw & doodle and tagged darkness, halloween, los muertos, traditions. Bookmark the permalink. Your drawings are beautiful, I love the little skull notebook too! Thank you for being part of Dia de Bloglandia!! I love the pumpkin. Nice work. I have Rosetta Stone for Spanish. It is one of my goals this year to learn. 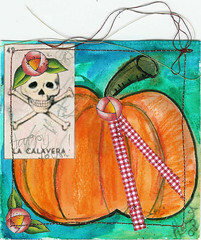 the pumpkin is fun…wondering if you use a special needle in your machine for sewing on paper? Your drawings are wonderful. They would make great cards for next year, don’t you think? Thank you for participating in this Dia! Your drawings are beautiful! I agree with Susanna…cards indeed next year! Beautiful drawings, thank you for sharing! And wow, don’t you have the NICEST mother? Those to DACs are great! I know what you mean when you say your drawings sometimes impress yourself. I’m like that too. love the artwork and yes it looks stunning ! Whoa, those scissors are way cool! woweeee! those scissors and pen are super fantastic! so are your drawings! it’s so much fun to impress ourselves, great work! thank you so much for sharing your dia de los muertos experience! What great drawings. And I love your journal pages. I saw a version of the pointy kitty you made once, in a zine I was reading,and I thought of you. Isn’t it interesting when we surprise ourselves with what we create? It’s like we are being gifted by our muse, which is also ourselves, and we realize that we aren’t kidding ourselves about being artists. We ARE artists! I really enjoy the character and style of your pieces, and I love it that you are part of this party! 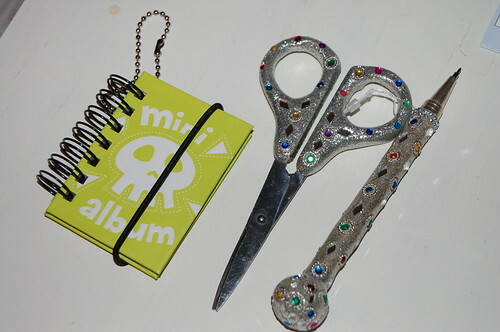 Oooh shiny scissors and pen, I love them and the skull notebook. Would make my day as well. Your drawings are truly great. I really like the idea of having a day when we are celebrating the dead, reminding ourselves of where we come from and that there isn’t so big a gap as a lot of people think. Thanks for all your comments on this post girls! Chris, I agree with you about creativity being a gift from ourselves, both back to ourselves and to the world (others)! I think it’s both beautiful and amazing. Thanks for your comments once again, you’re so generous with them! The pumpkin card is my favorite – the colors so vibrant and the skull just works!